One thing I have never really cared for is a Troma film, it’s not that I don’t appreciate what they do, but I think at times their minuscule budget and lack of talent, really leaves me with a disinterested response. Like I said before, it’s not that I don’t like what they are doing, I just personally cannot typically get into a lot of their films, it’s just below b-movie for me, and more like public access, or camcorder delivered. 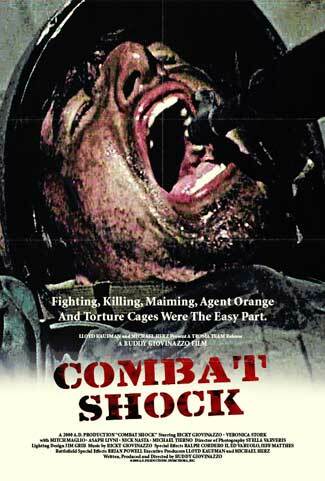 With all that being said I was a great deal swayed in wanting to watch Combat Shock, once I saw it was distributed by Troma Films. 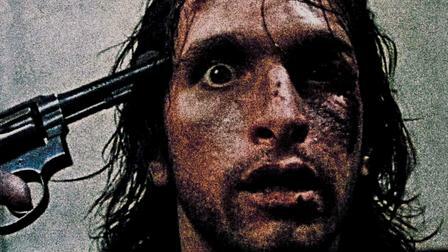 But after conversing with a group of bmovie, sleaze and gore fans, on facebook, the deliberated with me and guaranteed a good time if I watch it, so I did just that. The film begins in Vietnam, and is narrated by our lead character Frankie. From this we learn he was a captive of war, and obviously a veteran of war. We soon fast forward to his present life, and begin to see another grim and depressing scene, something that very well parallels with the horror of war. An apartment that looks uninhabitable, a nagging wife, a crying deformed alien baby… and a steaming pot that just whistles and adds to the agonizing reality of a life, without money, food or really any hope to carry on. This assembles him to face the streets and begin his search for a.) food, b.) money/job. We also are introduced to a small gang syndicate on the streets, that we find out Frankie owes money to, he is pardoned for a day to pay them back. We also find his friend who is a severally wasted heroin junkie. A lot of the characters we meet on the street are poorly acted and portrayed, very unconvincing and almost comical in appearance. It’s all forgiven because Rick Giovinazzo does a commendable job, as a desperate man who is down and out and just on the brink of crumbling from the realities of urban life. So yes, basically the whole movie is summarized with Frankie wandering the streets and receiving blow after blow, figuratively and physically. It’s absolutely the depressing tale of a man crumbling into insanity. 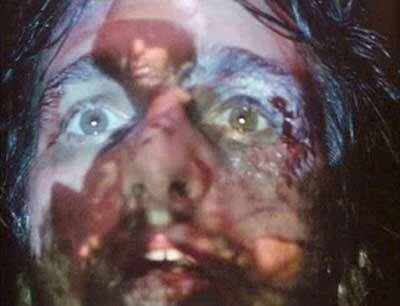 Some of the scenes seemed kind of pointless, but it did help attribute to the dark depressing tone of the movie. Something I found funny was when he was in the employment office and the guy says “life is hot Frankie, and because it is hot, I am compelled to remove my jacket…”. I read in an interview with the director, he said he had the scene of the junkie friend “skin popping”, the heroin… and then it launches to the scene of the employment office with the guy taking the pills… both addicts. There was nothing positive at all in this movie… it was great. Its made me want to check out more movies from the director. And with the baby, I can see the similarities with Eraserhead. He was definitely influenced by lynch on the movie.